Here is a set of animations, of air traffic, wind vectors, sector re-routing done by Dr. Kapil S. Sheth of NASA. This board is hosting these rather large files; a fast connection is required for several files. A Day in the Life of Air Traffic Over the Continental U.S. This animation was created using Future ATM Concepts Evaluation Tool (FACET) developed at NASA Ames Research Center. The data for September 6, 2001, was obtained from Volpe Center's Enhanced Traffic Management System (ETMS). It covers twenty four hours of traffic data, starting at 00:00Z (7:00 pm EDT, September 5, 2001) through 23:59Z (6:59 pm EDT, September 6, 2001), with each frame being, on average, three minutes apart. The display shows Air Route Traffic Control Center (ARTCC) boundaries in white, high altitude Sector boundaries in brown, and US State Boundaries in red. Each aircraft symbol represents an aircraft (not to scale) that filed a flight plan, including General Aviation aircraft. The total number of aircraft in the National Airspce System (NAS) considered by FACET at any instant of time is represented in the middle of status bar (at top). The animation was created to visualize traffic over the continental U.S. The animation starts off at 00:00Z, which is 7 pm EDT with roughly 4000 aircraft in the system. One sees bands of transatlantic flights traveling from the northeast (Boston, (BOS), New York (JFK), Newark (EWR), La Guardia (LGA), and Philadelphia (PHL)) towards Europe. Several streams of traffic can be seen across the country, some of them between Los Angeles-Houston-Miami (LAX-IAH-MIA), San Francisco-Denver-Chicago-New York (SFO-DEN-ORD-JFK), Los Angeles-San Francisco-Seattle (LAX-SFO-SEA), etc. As time progresses, one can observe a pack of flights taking off from Memphis, Tennessee, and Louisville, Kentucky, around 08:45Z (3:45 am EDT). These are hubs for FedEx and UPS, respectively. The box-haulers are taking off early in the morning for mail deliveries. In the middle of the night around 8:00Z, the traffic drops to as low as 600 aircraft in the whole system. Somewhere around 12:30Z (7:30 am EDT), there appears a vertical wall along the center of the country, east of which there is a multitude of aircraft, and west of which (4:30 am PDT), the day has not started for passengers. Proceeding from this time, the traffic gradually moves westward and ultimately the number of aircraft peak at about 4800! Roughly between the times of 15:00Z through 20:00Z, the animation displays transatlantic flights returning from Europe to the northeast. Although not as dramatic as the European flights, the planes between Asia and San Francisco can also be seen during 09:00Z to 11:00Z. During the animation, at various times, the hubs and major airports (Los Angeles (LAX), San Francisco (SFO), Seattle (SEA), Denver (DEN), Dallas/Ft. Worth (DFW), Houston (IAH), Minneapolis/St. Paul (MSP), Memphis (MEM), Atlanta (ATL), Chicago (ORD), Boston (BOS), New York (JFK), Washington, D.C. (DCA, IAD, BWI), Miami (MIA), etc.) in the country become clearly highlighted. The animation depicts how complex the air traffic system and the air traffic management problem are. It also manifests why the northeast corridor is a very difficult situation, not only for the local air traffic controllers but also for the Air Traffic Control System Command Center (ATCSCC) in Herndon, VA. The video clip shows the regional nature of aircraft density at various times of a day. It, however, demonstrates many of the problems in presentation graphics. The three overlapping spatial background overlays make cognition of geographic broundaries difficult from the choice of colour (dark red on black) and strongly emphasises some aviation - possibly ATC areas - related logical boundary. The use of a complex graphic for the aircraft dominates the image and obscures the backgreound information. If, of course, the intention is to present a graphic purely for visual purposes, then these objections are not substantial. Air traffic is analyzed without regard to state. I suspect they are provided here solely for those folks who might stumble on the site and need the geographic reference point. Typically, you would not see states at all and it is, in this case, visually distracting. The white boundaries, the most important and therefore provided with the most contrast to the black background, are Air Route Traffic Control Centers (ARTCCs). There are 20 ARTCCs in the continental United States. Each ARTCC has a building, with no windows but a bunch of radar displays, in which all the controllers responsible for the geographic region sit. The smaller blue lines represent sectors. Each sector is controlled by one controller or a team of two controllers. Sectors are something like counties in a state. In this case, however, there are, so to speak, counties on top of counties. Controllers are responsible for certain altitudes and there may be controllers operating the airspace above or below. Sector altitudes are grouped according to low, high, and super high. I would guess the blue boundaries shown here are either for high or super high sectors. This particular display, if I'm interpreting it correctly, shows congestion via MAP values. MAP values are thresholds intended to given an indication of when the controller is handling more planes than they probably should. This is over a 15 minute period. So, if a MAP value is 20, that means it is recommended that the controller not handle more than 20 aircraft over a given 15 minute period. They are not, however, absolutes, and planes will not start falling out of the sky when the controller is handling more than the recommend number. Every time the blue sector is filled in with red the controller was handling some number of planes greater than the MAP value. If you look at the congestion (MAP) link, you'll see a better representation of the aircraft - a single dot. My aplogies, when I say "this particular display" in the above post, I'm refering to the Congestion MAP animation. On the congestion (MAP), I found myself wishing I had a better sense of time of day. It was hard to read the animation and the clock at the top right. It could be just me -- I'm not used to the 24 hour display instead of AM/PM. I'd like to see the black background replaced with subtle shading representing time of day for each time zone. Use the darkest shading at night and the lightest shading for noon. Or maybe just three shades, one for business hours (9-5), another for just outside business hours (6-9 and 5-8), and a third shade for night. Of course, the background color would force trade-offs in the overlay and aircraft colors, but this could be managed. Perhaps we need something like the old GEOCHRON wall clock. to be able to see daylight. The Star Alliance has recently published a screen saver which depicts their airlines' aircraft globally. They do show the progression of day and night, which is very well done with satellite images of the earth for light and dark states. Accompanied, alas, by corny melodramatic space music divorced from the content. The production is similar to some birds' eye maps: intense detail of content framed by kitschy frames drawn around the map. It would be better to provide some voice narration saying what to look for and what is happening in the skilled (but somewhat arty) animations. If viewers want a naive look, then they could look at it first with the volume off and then again with the volume on. Compare and contrast, for example, the role of sound in the Music Animation Machine. The "Platform Vlieghinder Regio Castricum (PVRC) and Geluidsnet" (somthing like: platform for airtraffic discomfort in the Castricum-region and Noisenet) have developed an online realtime airtraffic simulation for web and googleearth. The map shows all airtraffic and noise measuringpoints and there limits of max. noise. It's a tool for the 'average' dutchman to control the noise-limitations for Schiphol-airport. First link http://radar.vlieghinder.nl is OK now. It was temporarely in overload due to extreme traffic after the public launche of this google earth service. The maps in this electronic atlas are animations depicting flight traffic over North America. All animations depict traffic over a 24-hour period as a time-lapse and were captured during the period of March 2003 to September of 2005. The location of airplanes was mapped using a program called FlyteTrax from FlyteComm, Inc. The program updates the position of flights every minute and also allows for the selection of flights based on the aircraft, airline, and the departure or arrival airport. Over 70 individual animations are included on the DVD that can be played at three different speeds. At 1440 frames each (the number of minutes in a day), over 100,000 individual maps were used to create the animations. Animation files average between 5 MB to 66 MB for a total size of 1.6 GB. 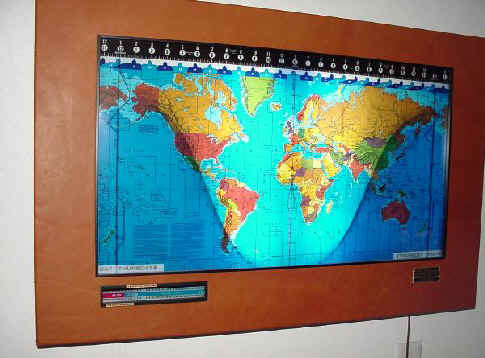 The distribution of this atlas is made possible with the use of DVD data discs. Not only does the DVD provide enough storage capacity but the fast communication speeds associated with the DVD format also allows these animations to be viewed directly from the DVD. The DVD is accompanied by a 44-page book that explains the North American air traffic control system, Aircraft Situational Display to Industry (ASDI), flight mapping, and air traffic patterns. Both the booklet and DVD are presented in a DVD case. Enjoy it! & Best Regerds! The yellow dots are airplanes in the sky during a 24 hour period. Stay with the picture. You will see the light of the day moving from the east to the west, as the Earth spins on its axis. Also you will see the aircraft flow of traffic leaving the North American continent and travelling at night to arrive in the UK in the morning. Then you will see the flow changing, leaving the UK in the morning and flying to the American continent in daylight. It is a 24 hour observation of all of the large aircraft flights in the world, condensed down to about 2 minutes. From space we look like a bee hive of activity. You could tell it was summer time in the north by the suns foot print over the planet. You could see that it didn't quite set in the extreme north and it didn't quite rise in the extreme south. I have never seen this before. We are taught about the earths tilt and how it causes summer and winter and have had to imagine just what is going on. With this 24 hour observation of aircraft travel on the earth's surface we get to see the daylight pattern move as well. I had a look at the Switzerland Air Traffic Radar from one of the earlier posts (http://radar.zhaw.ch/radar.html), and found an interesting feature - the aircraft shadow. Took me some time to figure it out: the shadow changes size with altitude, the higher the aircraft - the smaller and further away the shadow is. It goes with the convention that the observer is somewhere in the sky high above the area, and the sun is in upper left corner, but conflicts with constant size of the aircraft symbol. Overall, a nifty trick, works well. The colour coded trail works well too. Juice Analytics has developed two ways of viewing air traffic information.